Simply put, usually it goes to the player who has the combination of high point totals and low penalty minute totals. Pavel Datsyuk has won the award three years in a row, and is one of the finalists for the award again this year. Joining Datsyuk on the list of finalists are: New Jersey LW, Zach Parise and Tampa Bay RW, Martin St. Louis. Obviously, all three candidates are stellar options… but let’s briefly take a look at each player (as we have done with the other awards). 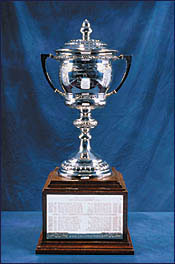 As of April 12th, 2009… the recipients for three of the many yearly NHL awards were decided: The Maurice “Rocket” Richard Trophy (which is awarded to the most proficient goal scorer each season), the Art Ross Trophy (which is awarded to the most proficient point getter each season), and the Presidents Trophy (which is awarded to the team with the best record at the end of the regular season). These awards are not determined by votes and as of the end of the last regular season game this past Sunday night, their winners have been determined. Every year as the NHL regular season wraps up, I find myself attempting to make predictions as to which teams will advance through the playoffs. This year is no different… so I’ve decided to break down my thoughts regarding the upcoming playoff series’ of the Eastern Conference. The Western Conference predictions will be posted tomorrow.